The university worked with a Wyoming school district to launch the federally funded professional development program, which trained K–12 teachers on project-based STEM learning. A federally-funded grant program created by University of Wyoming (UWyo) faculty that promotes STEM careers has wrapped up training 30 teachers from various K–12 schools across Wyoming and New Hampshire. RAMPED (robotics, applied mathematics, physics and engineering design) is a professional development program funded by the Wyoming Department of Education, through the U.S. Department of Education’s Math and Science Partnerships grant. The three-year program involves at least 25 teachers each year experiencing a 10-day summer institute that takes place on the UWyo campus. In the spring, the teachers attend six days of follow-up training in the Natrona County School District (NCSD), a major partner in the program. 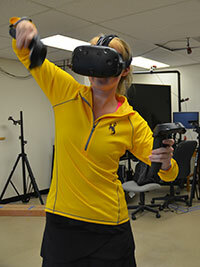 Teachers tested virtual reality equipment through the RAMPED program. Source: University of Wyoming News. For its inaugural year, the program began on July 1 with 18 teachers from NCSD, 10 from other schools in Wyoming and two from New Hampshire. The first week involved projects that used Raspberry Pi, Arduino and Baxter Robot, while the second week involved space, virtual reality and naturally inspired projects. Participants worked directly with physicists, astronomers, mathematicians, computer scientists and computer engineers to complete the projects. Planning for RAMPED began in the summer of 2015, after NCSD created a strategic plan to increase its graduation rates by working with UWyo instructors. Andrea Burrows, assistant professor of secondary education at UWyo College of Education, created and led the program. “RAMPED provides teachers professional development to enable six active-learning projects revolving around robotics, applied mathematics, physics and engineering design,” Burrows said in a news release from UWyo. To learn more about the program, visit the RAMPED site.